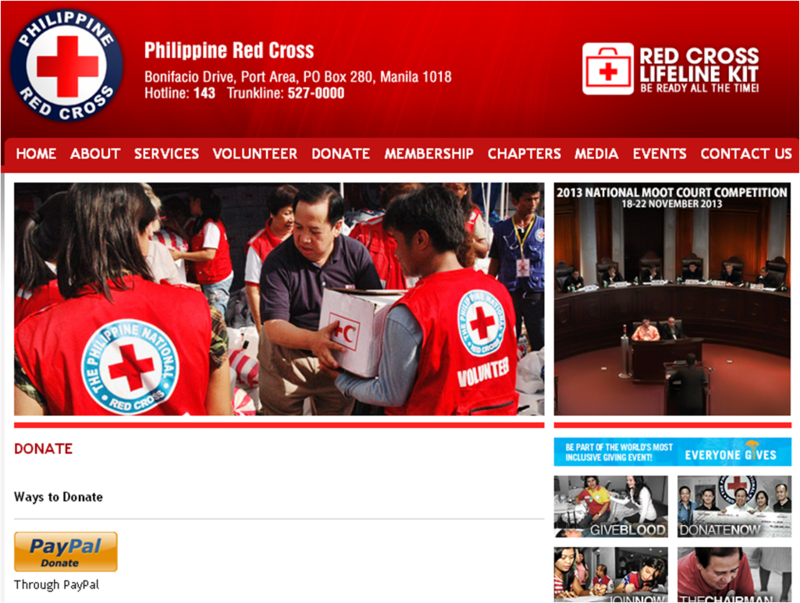 When it’s storming outside,I learned that the safest and fastest way to extend help to Philippine National Red Cross is through Paypal. Typhoon Maring once again awakened the Filipino spirit in us. The question is: Will this spirit be strong enough to force us into action? It’s nice to see posts from netizens volunteering themselves for the relief operations and then there are some who shows how to give dignity to the donations (in kind) they will be giving. People in the evacuation centers are obviously not in their highest esteem having to stay in inconvenient, jam-packed and possibly filthy basketball courts, classrooms or day-care centers. Putting ourselves in their shoes (or their bare feet), what would we feel if we receive worn-out and/or inappropriate clothes (suits, long gowns, nighties, used underwear)? We should at least make sure that what we give can really benefit the recipients. Beggars cannot be choosy. This statement can only hold true if you regard our fellow countrymen like that – beggars. Giving should be like giving a part of ourselves. We don’t give out our excesses. We give knowing that true giving hurts. This is why not only the privileged could donate. Each of us, no matter our state in life, could give a part of ourselves be it by donating or by volunteering. I salute the people who were not content on just watching the news after securing their own family and property. Kudos to those who inspire and pray for our people during the deluge. Many typhoons are bound to hit the country and while the government is yet to create master plans to alleviate high impact of floods we will all have to settle in packing relief goods for each other in the mean time. Even then, we should let the bayanihan flame provide us the “heat” when it’s cold outside. Lucky that my family has never experienced flood even when Ondoy and 2012’s Habagat came. Our neighbors living near the creek were affected. They will have to deal with the flood and its aftermath for maybe up to a few months from now. We won’t have to. Maybe to show gratitude for this great exception, I urge people to help, too. To make it more “convenient”, convenience stores and money transfer outlets found in every street corner serve as drop off points,too, of in-kind donations. Mainstream media offers a lot of ways to help. It’s hard to pretend not to see those. Please don’t ignore. Every centavo counts – just as a single shirt, a piece of soap or alcohol, a blanket, etc. Just as long as it’s a piece of us. It depends so much on how we view our lives but as I see it, all of us are given much. Acknowledgement I received more than a month later from GMA Kapuso Foundation. One thing I like about GMAKF is that everything seems accounted. Thanks, Joy. SM even raffled gift certificates (Php100 each) as token for those who donated through them.